In the gospel of St. Luke, Christ turns toward Jerusalem, making the choice of love through sacrafice. In the silence of our own hearts, we find a worthy call to action. 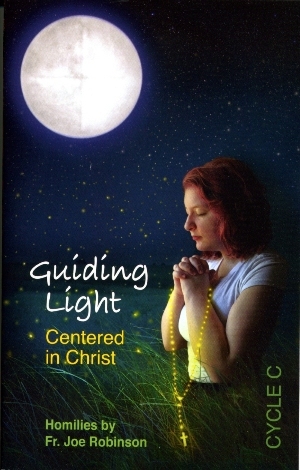 What personal path will you chose as you center in Jesus Christ? has dedicated his life to serving Christ and the Church from the Cincinnati Archdiocese in Ohio for over 40 years. He has served in six parishes in the Archdiocese and has taught at McNicholas and Seton high schools. He holds a license as a Professional Clinical Counselor from the State of Ohio Counselor & Social Worker Board. Today, Fr. Joe is Dean of the Cathedral Deanery, the pastor of St. Boniface Church and well loved by the surrounding community. He inspires his parishioners with the homilies found in these pages. They are not only practical, but also filled with light humor and a sense of hope, the hope of living out the Gospel despite today�s challenges. May they be a guiding light for you as they have been for so many others.